To engage the Bible more, you need to enter the world from which it came. From the beginning of Genesis to the end of Revelation, The Archaeological Study Bible Notes is filled with study material that opens your eyes to the archaeological, historical, and cultural contexts of the stories you read and the people you meet in Scripture. Take a journey back to the lands and origins of the Bible for an unparalleled encounter with the Word of God. Get insights into the roots of the Bible that will strengthen your faith and open new vistas of knowledge and understanding. Like no other study Bible, this one provides a sweeping, detailed look at the lands and times of Scripture, bringing to light the importance of ancient civilizations, practices, historical records and artifacts, literature, architecture, religions, laws, events, movements, geography, agriculture, wars and battles, political and monetary systems, historical figures and other factors that are critical to a deep and accurate grasp of the Bible. 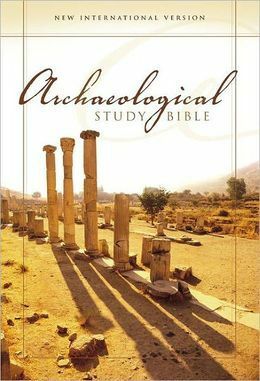 NOTE: The Archaeological Study Bible Notes product only contains the Archaeological Study Bible Notes. For instructions on how to download the NIV Bible text for free go here. The NIV Bible text (or the Bible translation of your choice) uses the Olive Trees Bible App's powerful Resource Guide feature to link these two resources.